Applanix will provide WatCAR with its POS for testing autonomous guidance and control systems in real-world conditions. Photo source: Applanix. Applanix, a Trimble Company, announced this week that it is collaborating on advanced research for autonomous vehicle guidance and control systems with the University of Waterloo Centre in Ontario, Canada for Automotive Research (WatCAR). Applanix will provide WatCAR with its Positioning and Orientation System (POS) for testing autonomous guidance and control systems in real-world conditions. Applanix will also provide the Trimble GNSS-Inertial board set for integration with car systems and sensors to enable precise positioning. The Applanix POS LV is described as a robust, reliable and repeatable positioning solutions for on- and off-road vehicles. Applanix technology will be used by WatCAR to assess the performance of the guidance and control systems on board their autonomous vehicles. This testing will take place in challenging weather conditions and environments including on roads under repair, with lane reductions and closures, are wet or covered in snow, and where there is poor visibility. Applanix will also provide WatCAR with the Trimble on-board GNSS-Inertial board set designed for high-performance, high-volume Original Equipment Manufacturer (OEM) applications. These products, currently used in a variety of autonomous vehicle programs, include the Trimble AP GNSS-Inertial board set that includes a high-precision Inertial Measurement Unit (IMU). Small, rugged and low powered, the AP board sets provide the precise positioning needed for autonomous vehicle applications as they navigate their environment. 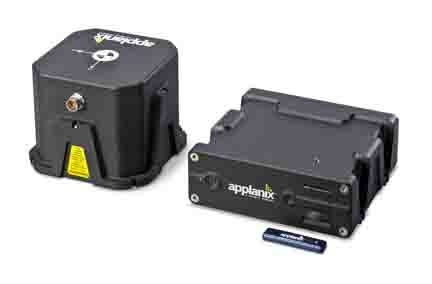 Ideal for use on all sizes and types of vehicles, the AP boards feature Trimble’s high-performance precision GNSS receivers and Applanix’ IN-Fusion GNSS-Inertial integrated technology that produces uninterrupted position, roll, pitch and true heading measurements of moving platforms, according to the company. Integrating easily with vehicle sensors, the AP board sets are essential for precise vehicle control when interacting with a constantly changing environment. Trimble has a long history of using automation to improve safety and productivity — from pioneering automated blade control for earthmoving and providing positioning solutions for some of the earliest robotic applications in the 1990s to delivering automated steering for farmers and providing positioning technology for fully autonomous off- and on-highway trucks. In addition, Trimble further enables high-accuracy solutions by leveraging its global infrastructure to deliver GNSS corrections to support autonomous operations globally. The relationship with WatCAR will aid in improving the core technologies that deliver high-end systems capabilities for a variety of Trimble markets. “The Trimble AP products, first introduced in 2009, are designed for use in small, mass market vehicles where size, weight and cost factors are important. They have also been designed to easily integrate with the industry’s leading sensors, making them an ideal solution for autonomous vehicle navigation systems and sub-systems,” said Nastro. “We welcome the opportunity to work with Applanix, a leader in reference systems. Their technology identifies, with very high accuracy, the exact location of our vehicle at all times," said Ross McKenzie, Managing Director of WatCAR. "Applanix is a valued industry partner and their team is great to work with. Going forward we anticipate a solution that will enable autonomous vehicles to traverse the real world reliably and safely." The Waterloo Centre for Automotive Research (WatCAR) conducts advanced research to further automotive innovation and competitiveness. From active safety to automated driving through lightweighting and advanced powertrains, 130 faculty researchers comprise the largest university-based automotive activity in Canada. Leading-edge studies for industry partners around the world enhance vehicles, components, and their materials with new approaches and integration of innovative technologies.